Discussion in 'General Music Discussion' started by HurrDurr, Mar 27, 2014. This is the Deafheaven Thread. A quick search led to no direct results (albeit a few mentions in various other Post-Rock/Black Metal/Shoe Gaze threads). I'll start: I just saw Deafheaven live last Friday (3/21/14) on tour with BTBAM/Intronaut/The Kindred @ Revolution Live, Ft. Lauderdale, Florida and the show was phenomenal. Even BTBAM sort of hinted they knew Deafheaven had seriously stole the show that evening. George definitely broke the 4th wall of performance that night leaving us with a great first impression of the band. I'm genuinely hoping they can make the trip back down to SoFla some time in the future. I saw that tour in Syracuse. I was realllly impressed with the The Kindred and Inronaut. Did you happen to notice that? Also i literally bought a POD to get their guitarists tone. 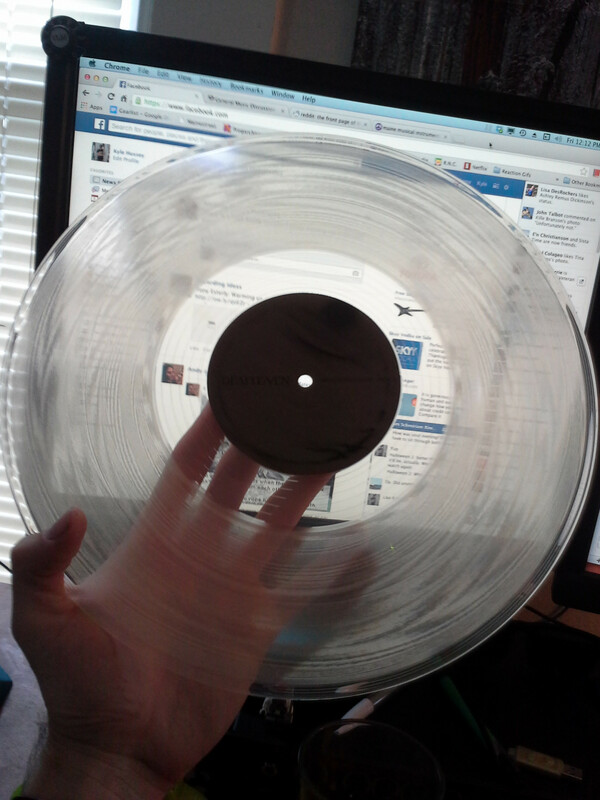 It's Roads to Judah in clear vinyl. 1. The closest they've ever come is Boston, which is usually how far I have to go for shows, but I'm the only Deafheaven fan in my friend group. I'm not going to drive 6 hours each way to see a show by myself. 2. From what I've seen on youtube, they seem to draw a large mix of people who don't normally go to meal shows when they're headlining. This annoys me because it will be filled with people who are too afraid of not looking "cool" to headbang, and will also ridicule you for doing so (not that I'm really one to give a damn what people think of me). It also seems like the kind of crowd that doesn't ever move, and gets upset and/or mad when you bump into them. In the pit. At a metal show. This is one of my biggest show pet-peeves, and the majority of the crowd seems to be this type of person. Like I said, thats just from what I've seen on youtube and stuff, but its still enough to keep me away until they come closer, which could be never. Oh... The crowd moves... TRUST ME. Like you, I too thought I'd never see them live. Their sound, although filled with popular influences, seemed to me at least still a bit too metal to form a bridge for other folks to get into them, but to my amazement I was proven wrong. All the acclaim, positive reviews, and even awards they've received for Sunbather's release was completely shocking to me. When I heard they were on the BTBAM bill, I knew it was gonna be a great tour and I had hoped they'd travel to SoFla and the did. Maybe someday they'll visit somewhere near your town. Aside from that though I am insanely jealous of your RtJ vinyl. That's a treasure for sure. And to answer your question cwhitey2, I honestly can't say I remember them being at all 'too' loud or much louder than any of the other bands but I can remember the overall volume being absolutely perfect. It wasn't ridiculously loud like a lot of other shows and the mixing was perfect aside from George being a bit buried in there at times, but that's usual live sound. They had no problems at all during their set also, so that was pleasant. oh FFS. There have been at least another 2 threads on deafhaven. Yes, there was a thread for Sunbather and a thread for the Dream House single last year. I felt they deserved their own thread so folks can talk about them here and I could discover other people that were really into them. They do plan on branching outward to Europe later this year, although I'm not exactly up-to-date on what cities they'll be performing at. All that info should be on their Facebook profile. I really dig the album as a whole. I'm not the type of person to pick and choose one track out of the album and listen to just that track aside from the full album, but I guess if I absolutely had to pick those would have to be my favorites as well. The beauty of Dream House, and the ferocity of Vertigo are excellent. Sunbather was one of my favorite releases of 2013, such an awesome album. Had the chance to see them last May, but like an idiot I left the show early because I hadn't heard of them before, and I was tired. I've seen them live a few times, I love that band. I was disappointed with their set though, their songs are long enough to the point where a short 30 minute set is about 3 songs so the song selection was kind of weak. I'm gonna go see them live next month with Earth and since they're headlining it should be a much better setlist. The ProfEscher This is infamy. I don't understand their massive sudden popularity or how they landed a spot ABOVE Intronaut on the BTBAM tour when Intronaut has more material and has been around longer. Granted, I don't really listen to either black metal or post rock but I don't get this band or why they're suddenly the hip band to name drop. I have listened to this Sunbather album and am TRYING to like it. But it just sounds like solid screamo shoegaze. Do I need sedatives to enjoy or am I just too metal for this. Help me understand this band bros. I don't get the big wow factor here. I was at that show in Syracuse! Deafheaven is really *not* my cup of tea with Sunbather, although I felt Roads to Judah had a fantastic energy about it, despite being a bit saccharine. The band really shines on their cover of Mogwai's "Punk Rock/Cody." I like Deafheaven and have been spinning Sunbather since it came out. Weirdly enough Deafheaven's sudden explosion in popularity is from them being embraced by hipsters because they have been heavily featured on Pitchfork, Vice, and Noisey. Personally I think it's awesome for them to have this type of popularity playing the type of music they do, but there is always going to be backlash with anything the hipsters embrace. I think that originally Intronaut were playing above them, but due to Sunbather's sales Deafheaven were bumped up to main support. I like them a lot. Sunbather is definitely my most listened-to album of 2013, and I'm still spinning it about once a week. I'm a big shoegaze guy, and my taste in metal is of the slow, moody ISIS/Deftones variety. So Deafheaven was a surprise to me, cause I didn't think I could get into the vocals or blast beats, but it just works for me. See, I think that was a good crowd because BTBAM was headlining?